Reminiscent of Old-World Manors, this stately home features a stone and stucco exterior with a hip roof and bonneted dormers. An elegant balustrade crowns the entryway, which is highlighted by columns and arches. Open, yet with more room definition for those that seek a traditional layout, the interior includes custom-styled elements and appointments. A grand staircase leads to a balcony loft, which separates the two-story foyer and great room. Built-in cabinetry, a striking fireplace and French doors that lead to the veranda enhance the great room, while bay windows extend the master bedroom and breakfast nook. An island adds convenience to the kitchen, and the spacious master bath is well-equipped. Upstairs, all four bedrooms are topped with vaulted ceilings, and the bonus room can be converted to a home theatre, office or gym. 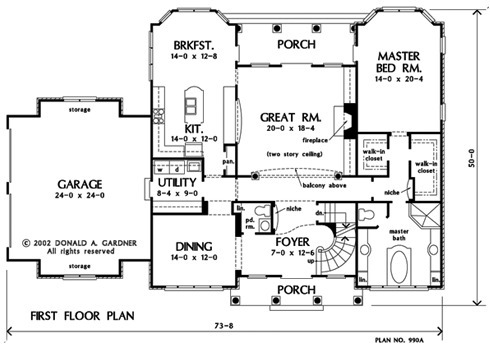 1st Floor: 2062 Sq. 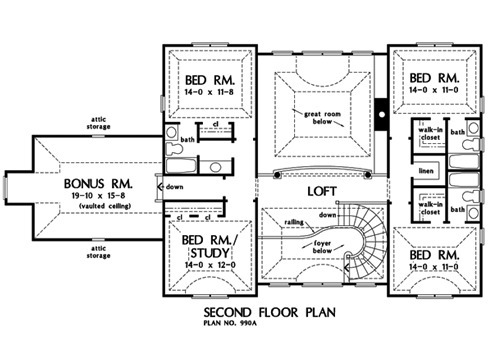 Ft.
2nd Floor: 1279 Sq. Ft. Bonus Room: 386 Sq. 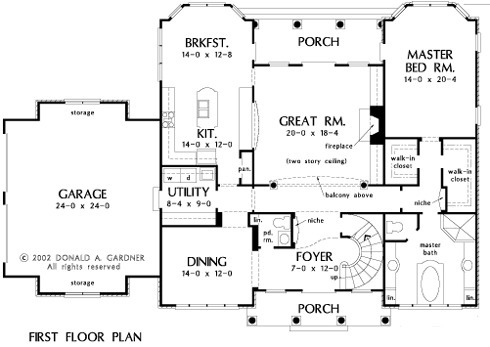 Ft.
House Dimensions: 73' 8" x 50' 0"
Great Room: 20' 0" x 18' 4"
Master Bedroom: 14' 0" x 20' 4"
Foyer (Tray): 7' 0" x 12' 0" x 22' 1"
Dining Room : 14' 0" x 12' 0" x 9' 0"
Great Room (Tray): 20' 0" x 18' 4" x 22' 1"
Kitchen : 14' 0" x 12' 0" x 9' 0"
Breakfast Room : 14' 0" x 12' 8" x 9' 0"
Utility Room : 8' 4" x 9' 0" x 9' 0"
Bonus Room : 19' 10" x 15' 8" x 9' 0"
Garage Storage : 13' 4" x 2' 8" x 0' 0"
Master Bedroom : 14' 0" x 20' 4" x 9' 0"
Bedroom / Study (Tray): 14' 0" x 12' 0" x 12' 0"
Bedroom #3 (Tray): 14' 0" x 11' 8" x 10' 6"
Bedroom #4 (Tray): 14' 0" x 11' 0" x 12' 0"
Bedroom #5 (Tray): 14' 0" x 11' 0" x 10' 6"
Porch - Front : 20' 0" x 5' 4" x 0' 0"
Porch - Rear : 20' 0" x 7' 0" x 0' 0"
Loft / Study : 20' 0" x 4' 8" x 9' 0"
Storage (Other) : 13' 4" x 2' 8" x 0' 0"